One of the main pieces of advice given to all new parents is to have a set routine. However, what many don’t realize is that there are a few different types of routines you can try out. As each baby is different, there is no universal routine that works. Instead, you need to create a routine that best suits you and your little one depending upon various factors. While the routine you create will be specific to you and your baby, there are three general types you can choose to build your individual routine around. These include parent led, baby led and combination routines. So, which one is best? Here you’ll discover everything you need to know about each type to help you decide. Parent led routines are typically the strictest. It is down to the parent to decide what times your baby sleeps, eats and plays. With this type of routine you will need to be extremely consistent and very rarely deviate from the daily structure you’ve set. Many experts claim this is the best style of routine as babies thrive on strict schedules. It can also minimize on-demand feeding; something that many parents struggle with. Feeding, playing and sleeping times never change, regardless of what your baby wants. However, the American Academy of Pediatrics has warned against this type of routine, particularly in terms of feeding. There is a risk some babies may not get enough to eat if they aren’t being fed whenever they are hungry. You can avoid this by ensuring you feed them frequently enough and you familiarize yourself with how much food your baby needs as they grow. The main thing to watch out for with parent-led routines is that you are putting your baby’s well-being first. If you withhold sleep or food simply because you don’t think it’s the right time, it can lead to various problems. Should you try it? – There are pros and cons to this type of routine. Many parents swear by it, but you do need to be quite strict and not be swayed by baby’s cries. Parent led routines certainly aren’t for everyone, but they can be very effective when planned properly. Baby led routines are the opposite of parent led routines. They tend to be much more relaxed and you schedule feeding, play time and feeding time around your baby’s natural cues. After a few weeks, the majority of babies develop their own regular patterns, making it easier to determine what they need and when they need it. So, it isn’t completely unpredictable and there is some order to the routine. It just isn’t as strict as a parent led one. What you’ll notice with this type of routine is each day will vary. For example, your baby may want a nap at 1pm one day, but the next want one at 3pm. Some experts believe this works better than a parent led routine as you’re actually listening to your baby’s needs. In particular, it encourages breastfeeding your little one on-demand. This can avoid issues with dehydration and poor weight gain. Of course, there are a few disadvantages to this type of routine, including the fact it can be more difficult to get your baby to sleep at certain times when it’s more convenient for you. Some parents also don’t like the unpredictability of the routine. You will need to really study your baby and know their cues for different needs. So it can be a lot harder, but as with parent led routines, many parents swear by it. Combination routines tend to be the most effective. Combining both parent led and baby led elements, this type of routine is recommended by many experts. So how does it work? Typically, you’ll set a routine that works for you in terms of feeding, nap and play times. The majority of the time you’ll stick to this routine. However, you also have the option to be a little more flexible than a parent led routine, pushing back a nap for example if your little one doesn’t seem tired, or feeding a little more frequently if your baby is particularly fussy one day. The reason this routine comes highly recommended is because it provides consistency that baby’s need, without restricting you too much in terms of set timings. So now you know the basics behind each routine, how can you decide which one is right for you? The first thing to consider is your parenting style. Are you good at sticking to things? If you tend to be quite organized and consistent, a parent led routine could be your best option. However, if you find it difficult to stick to rigid time scales and you’re not an overly strict parent, a baby led routine could be the ideal solution. Combination routines are suitable for anyone and actually fit modern parenting quite well. Giving you flexibility to change the routine if needed, it’s something most parents will find easy to stick to. Overall there is no one set routine that will work. All babies and parents are different so you need to make sure you’re choosing a routine that works for you and your little one. Take into account the pros and cons of each routine before deciding what’s right for you. Have you got any tips that worked for you when setting a routine? Let us know below! Great explanation of both types of routines. Honestly, so many parents, especially the new ones (I was one of them) forget how important a routine can be for a newborn and a toddler. Just look at us adults, even we, have constant routines and structures in every aspect of our life. So routines are very important but it’s also crucial how you set them up as you’ve described above. 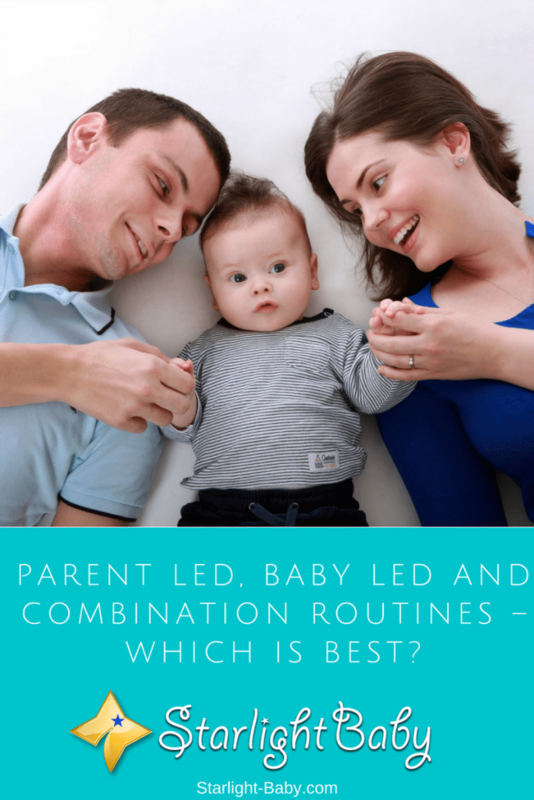 We have been using the combination of both, parents and baby led routines because I believe that it’s the best option. We have scheduled the basic things like feeding time, nap time, play time, and so on but it is impossible to be completely oblivious to the factors that can throw these scheduled things off – we often had the problem that he just wasn’t sleepy yet so we moved the hours around every now and then so it fit what he needed. You always have to consider the baby’s needs as well. Thanks for the exposure. I appreciate the usefulness of parent led and combination routines especially for the modern society. However, I am personally in love with the baby led routine simply because it is natural, simple, child centered and had existed for long. parents led routine does not always work. Let me exemplify. When we had a baby, we fed him every two hours. Sometimes he threw up, sometimes breasts did not produce enough milk. THus, our feeding routine sometimes deprived his food. Therefore, we also had to go by baby’s routine. We fed every two hours, and when he threw up or did not suckle breasts for 20 minutes, we reduced our feeding time. I believe a combination routine is the best. I took time to read in between the lines of each routine, and I found each and every one of it more educative as well as interesting and informative. From what I understand in all these routine, I definitely think that the combination of both parent led and baby led routine seems to have a better results and influence on both the parents and baby’s disposition. Finding the right time and pattern to tweak in between the routine would serve both the parent and the baby’s needs properly. The combination of parent led routine and that of a baby led routine will work great for those parents that really care about how the baby gets better as they grow. Still, it is good that many parents understand that whatever routine they decide to choose, everything should revolve around what the baby really want to avoid issues such as weight loss and discomfort for the baby. As much as it would be nice to observe the baby and attend to its need as and at when it’s paramount, I do believe the parent led routine is more appropriate, because keeping to do it as the baby wants would never afford the parent any chance to manage and control their daily schedule. Maybe once in a while the parent allows for baby routine but this shouldn’t be made a habit so that the baby doesn’t get too comfortable with his own led routine in order not to make things too difficult for the parent.